In her international bestseller Simple Abundance, Sarah Ban Breathnach inspired millions of women to find happiness in each day of their lives. 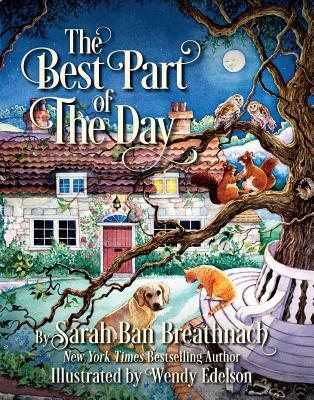 Now Breathnach is back with her first children's book, The Best Part of the Day. Beautifully illustrated and lyrically written, this "good night" story encourages children to find at least one moment in each day that is worthy of celebration. The Best Part of the Day is the perfect addition to any family's nighttime routine. Sarah Ban Breathnach, a writer of remarkable wisdom, warmth, and compassion, has become a trusted voice to women around the world. Sarah is the #1 New York Times bestselling author of Simple Abundance: A Daybook of Comfort and Joy and the creator of The Simple Abundance Journal of Gratitude. Her work celebrates quiet joys, simple pleasures, and well-spent moments. Sarah reminds us to search with appreciation and awe for the small and the sweet in our daily lives. Following her sage insights, millions of women, including Oprah Winfrey, discovered unexpected contentment and solace in their own lives. Sarah lives in Southern California near her daughter, Kate, and their beloved animals. Wendy Edelson's beautiful watercolors have graced over thirty children's books as well as book covers, posters, pet portraits, print ads, calendars, fabric collections, puzzles, games, and collectibles. When not painting in her studio, she works in her garden, dreams of her next project, writes, works out, plays with her fluffy corgi, and listens to her husband, a professional jazz drummer, play music.